KEY FEATURES: A lens-shaped single-celled plant, 50-120microns in diameter (about the diameter of a human hair). Its body is covered with cellulose plates and it has two flagella, which enable it to swim when disturbed. They make their food by photosynthesis. SIMILAR SPECIES: Gambierdiscus toxics is the prime causative agent of ciguatera in Eastern Polynesia. However other members of the genus known to occur (in French Polynesia) include: Gambierdiscus belizeanus Faust, Gambierdiscus yasumotoi Holmes, Gambierdiscus polynesiensis Chinain & Faust, Gambierdiscus australes Faust & Chinain and Gambierdiscus pacificus Chinain & Faust. Some of these species are probably in the Cook Islands. TAXONOMY: PROTOCTISTA (Algae); DINOFLAGELLATA (=Pyrrhophyta); HETERAULACACEAE. COMMENT: The Kingdom PROTOCTISTA is a catch-all of unicellular and multicellular organisms which don't fit into the Animal, Plant, or Fungus Kingdoms. It includes the Protozoa and simple Algae formerly in the Kingdom PROTISTA, along with the Green, Brown and Red Algae (formerly in the Plant Kingdom), and various simple fungi (formerly in the Fungus Kingdom). 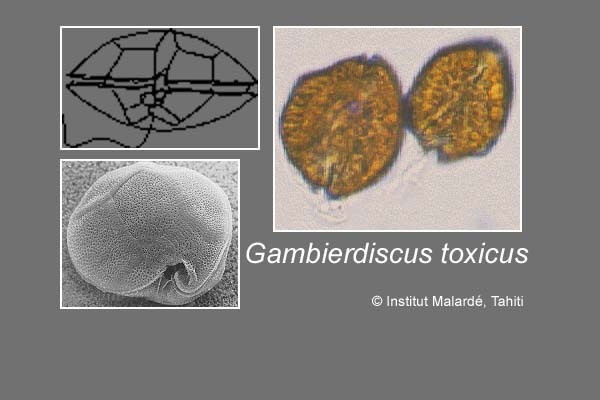 GENERAL NOTE: "The dinoflagellate Gambierdiscus toxicus, the primary causative agent of Ciguatera Fish Poisoning in French Polynesia, was discovered by Yasumoto and Bagnis from the Gambiers Islands in the late 1970's. This unicellular, armored microalgae is generally found attached to macrophytes that proliferate on dead coral substrates. Gambierdiscus is the source of two types of potent marine toxins i.e. maitotoxins (MTXs) and ciguatoxins (CTXs), these latter being regarded as the principal cause of human illness. These toxic compounds accumulate through the food chain, from herbivores grazing on the coral reefs into the organs of carnivores that feed on them. The genus Gambierdiscus is characterized by a circumglobal distribution between 35° N and 35° S. Gambierdiscus is endemic in relatively low densities in most areas of Tahiti. However, episodic blooms of this dinoflagellate may occur, and cell densities up to 10,000 cells/g of macroalga have been reported occasionally. Each of these blooms contribute to maintain a high toxic reservoir in fish and may be followed by ciguatera outbreaks. The precise factors initiating bloom occurrence were investigated through the long-term survey of Gambierdiscus populations in Tahiti, from 1993 to 1997. Our results indicate that temperature plays a significant role in the seasonality of this dinoflagellate in nature, as Gambierdiscus populations tend to reach maximum abundance during the hot season (September to March). We also provided evidence that coral morbidity, resulting from either cyclonic events, coral-bleaching episodes, marine pollution or anthropomorphic activities, may be another critical factor in the genesis of naturally-occurring blooms of this dinoflagellate, in that it provides "new surfaces" further colonized by opportunistic macroalgae that are ideal hosts for Gambierdiscus cells. Toxicity of Gambierdiscus blooms - expressed in MU/1,000 cells - was also shown to vary significantly over the period of survey. No direct correlation was found between this toxicity and bloom biomass (cell yields) nor the seasonal pattern of various environmental parameters (temperature, salinity….). The consumption of reef fish that have accumulated the various 'ciguatoxins' induces within a few hours after the toxic meal, a large array of symptoms including gastro-intestinal, neurological and cardio-vascular troubles. The seriousness of the symptoms depends on the species of the fish, the amount of ciguatoxin ingested, and the individual susceptibility. Physiopathology is characterized by a set of neurological symptoms for which the determining signs are mainly changes in the cutaneous sensorial sensitivity such as paresthesis (of the extremities and/or the perioral area) and dysesthesis (inversion of the perception of hotness and coldness). Furthermore, ataxia, arthralgia, myalgia, vertigo, hypersalivation, itching and asthenia more or less durable in time are very frequent symptoms." [Malarde Institut, Tahiti, Website, 2002] Gambierdiscus is in the same family as some of the 'red tide' planktonic dinoflagellates of temperate areas. These make a variety of related toxins, such as Saxitoxin and Brevetoxin.